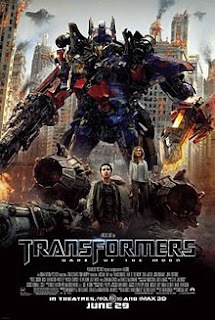 Transformers: Dark of the moon is the latest movie of the transformers film series. It was released on June 23 and is directed by Michael Bay. Although the movie has received mixed reviews I think it's great. The movie offers action, graphically impressive scenes and I must say some pretty good humor. Shia LaBeouf is still starring as Witwicky and I think he does great. The girl that replaced Megan Fox on the other hand did not such a good job. She was a little dull and her facial expressions were not that good. Like I said there was a lot of humor in this movie and this was because of the dialogs between Shia and the two little robots that are his pets. These two robots were absolutely hilarious and made the movie so much better. I think this movie is the best of the transformers franchise and I absolutely recommend it to everyone. Although I have to say I liked Megan Fox better than Rosie Huntington-Whiteley (Carly Spencer).